People in the United States celebrate the groundhog on Groundhog Day but view them as bothersome garden pests during every other day of the year. They are small mammals which eat lots of the plants which humans like to grow, including vegetables and the roots of some flowers. Because these animals have the ability to destroy gardens, many people want to remove them from their property. When this is the case, they can catch them. 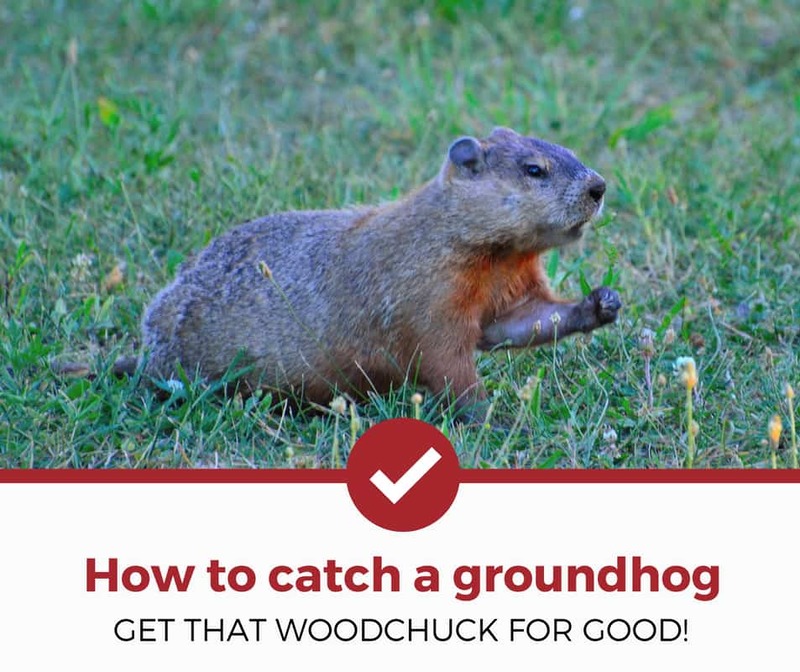 As an FYI, this guide focuses more on "catching" groundhogs. For a information specifically on groundhog removal, check out this article. How To Pick A Groundhog Trap? How to Pick Your Bait? Groundhogs are herbivores which weigh between 10-13 lbs when fully grown. They are the largest member of the squirrel family and are mammals with well-developed teeth. These curious animals (often called woodchucks as well) only live in North America and can eat an entire pound of food in one day when getting ready for hibernation. When it's time to mate, the male groundhogs will visit the den of each female to introduce themselves and decide who they like. Groundhogs possess some of the most elaborate homes of any animal. They live in burrows which can span between 8 and 66 feet in length and feature multiple exits—increasing the challenge to catch these animals. Although these animals are notorious for their aggression when being trained, wild groundhogs or woodchucks actually avoid humans as much as possible. They would rather run away than be captured and generally don't like confrontation with people. Groundhogs do have the ability to carry rabies, but it's very rare that you'll find a groundhog infected with this disease. With their large, well-developed incisors, woodchucks can hurt pets. However, because they are such non-confrontational animals, they will avoid getting into a fight as much as possible. People who let their pets roam the yard should be careful if a groundhog is in the area, as it might feel threatened if a cat or dog starts investigating its burrow. Rabies is always a possibility to transmit from one mammal to another (albeit a rare one). Since woodchucks are herbivores, their diets primarily consist of flowers and garden vegetables. Some of their favorite snacks are peas, carrots, apples, dandelions, and the bark of trees. Sometimes they might eat insects, but only if other food isn't available. The best way to catch a groundhog is with a trap and some bait. For detailed instructions on how to bait and prepare your trap, check out the video below. There are a few different styles of groundhog trap. Most look like simple metal cages with a door that swings closed when the animal steps on a pressure plate. These have handles so the user can pick it up and move the woodchuck to a new area. Size, since woodchucks are large. Look for something with at least 15-24 inches of space. External handles. An angry woodchuck might bite through the cage, so handles are necessary for moving the cage. While manufacturers do create traps which hurt or kill groundhogs, these are losing favor in the United States as more and more people don't want to hurt the animals. These can be purchased but ones which injure will require you to either move the wounded animal or kill it yourself. There are also laws in some states which prohibit the killing of groundhogs, so read local law to help determine what trap to buy. There are many different foods which can be used to attract groundhogs. Not many companies produce special baits, but woodchucks enjoy fresh fruits and vegetables with appealing smells. One of the most attractive options is an apple cut into chunks so the groundhog can smell the fruit. Chopped, juicy cantaloupe also works. Woodchucks will additionally seek out dandelions, vegetables like fresh peas, and fruits like raspberries. Any of these make a wonderful bait, as the surefire way to a win over a groundhog is through its stomach. Keep in mind, though, that weather may not be your friend as far as bait is concerned. As mentioned in the video above, the extreme heat can wilt fruits and vegetables before the groundhog has a chance to sniff them out, so we recommend using strong baits which can withstand the warmer temps. Groundhogs don't have to be a menace in your garden. They can be trapped and moved to a new location or eliminated, if you prefer. If you're considering catching a groundhog, make sure to wear proper safety equipment like thick gloves and do research on the trapping or exterminating laws in your area. Good luck, and don't let the groundhog hog your grounds! Curious about other groundhog related articles? Check out our other detailed guides to help you deal with your pest problems.